The Payments in Lieu of Taxes (PILT) program was created in 1976 and provides payments to counties and other local governments to offset losses in tax revenues due to the presence of substantial acreage of federal land in their jurisdictions. As federal land is not taxable by local governments, public land counties have struggled to provide adequate services to the public in light of the annual losses in tax revenue. Counties with public lands in their jurisdictions often provide critical services on those lands including law enforcement, search and rescue, fire management, solid waste disposal, and emergency medical services. Today, the U.S. Department of the Interior makes PILT payments to over 1,850 counties in 49 states, the District of Columbia, Guam, Puerto Rico and the U.S. Virgin Islands. The federal government owns roughly 635-640 million acres, or 28 percent, of land in the U.S. 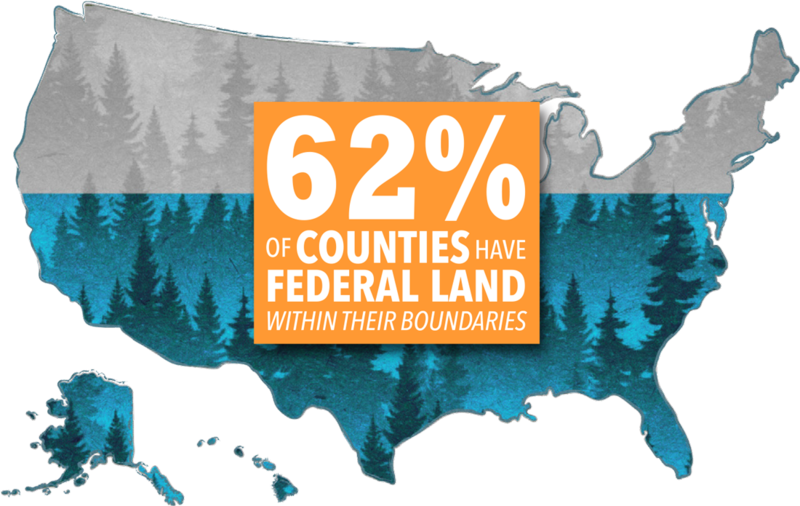 Approximately 62 percent of counties have federal public land within their jurisdictions. As federal land is not taxable by local governments, PILT provides payments to counties to offset losses in property tax revenues and also to reimburse counties for the critical services they provide on that land. 61.6% of counties have federal land within their boundaries. Even though they are not able to collect property taxes on federal land, county governments must still provide essential services for their residents and those who visit these public lands each year. Such services include road and bridge maintenance, law enforcement, search and rescue, emergency medical, ﬁre protection, solid waste disposal and environmental compliance. With sympathetic legislators in influential positions, county and congressional supporters of federal public lands policies feel they’re in a better place than ever to achieve long-term stability for crucial funding programs. During the 2019 NACo Legislative Conference, public lands county officials and Members of Congress convened on Capitol Hill for a press conference in support of full, mandatory funding of Payments In-Lieu of Taxes and a long-term solution for the Secure Rural Schools program. Join public lands county officials and Members of Congress on Capitol Hill for a press conference in support of full, mandatory funding of Payments In-Lieu of Taxes and a long-term solution for the Secure Rural Schools program. Sixty-two percent of the nation’s counties contain federal lands. The PILT program helps to offset costs incurred for county services — including road and bridge upkeep, public safety and emergency medical services — provided to the users of untaxable federal public lands. County officials from across the nation will descend on Capitol Hill to advocate in support of the Payments in Lieu of Taxes (PILT) program.